Aren't these beautiful! 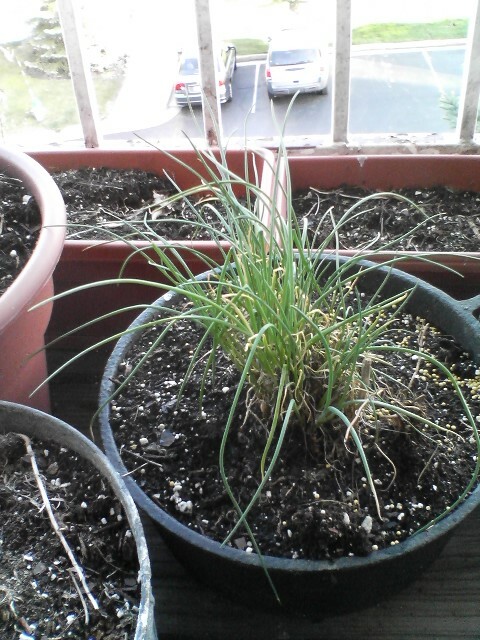 I love it when my chives come back year after year. They are the first sign of spring for me, they begin to green up in late February but they wait patiently to explode until the beginning of April! By next month they'll have beautiful lavender blossoms that smell sweet and oniony? at the same time! I love to chop them up and use them in butter, or simply strewn over a luscious spring salad! I just love lettuce! There is something so very satisfying about planting it and picking your own salads. 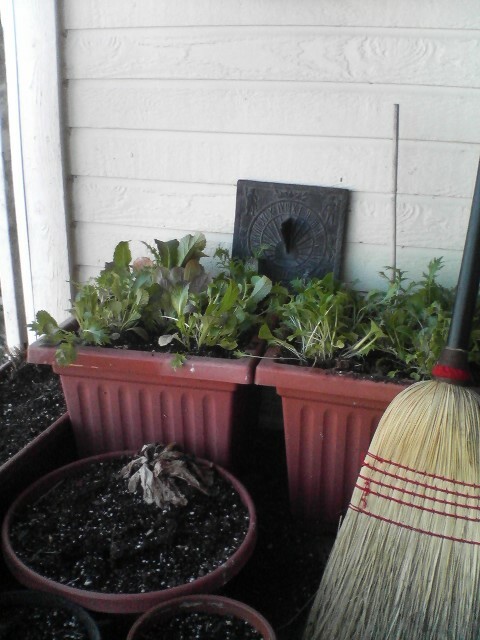 Mesclun mix is absolutely perfect for a container garden like mine. Plant it, fertilize it and water it, that's all you need to do to make it happy! When it gets a bit warmer it WILL start to bolt but usually I have good salads through June. Make sure that you eat the Arugula blossoms and the Mustard blossoms! They are so rich in vitamin C and so good for you. Chop them up and mix them with butter, then let that melt over grilled tuna that you've laid on a bed of your homegrown greens. The butter and blossoms make a simple yet savory sauce that's bright enough to complement the flavor of the griiled fish. 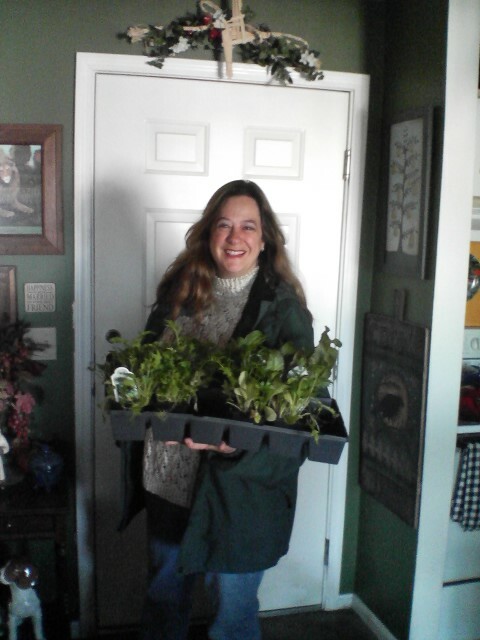 Finally, enough sunshine to plant lettuce!!!!!!!! My "Wild Garden" is a container garden, as we live and love up on the third floor of beautiful southwest facing apartment! My patio is just big enough to be dangerous for an obsessive gardener like me, and my husband LOVES to complain that we never have enough room to sit! Next stop....Whole Foods (Yes ,we finally have one in Cleveland!) for tomato plants! 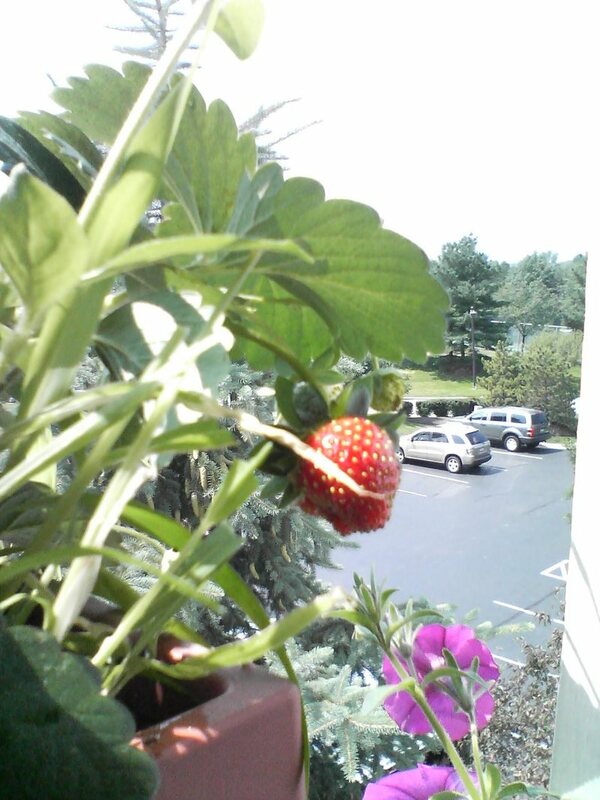 The First of the Strawberries! And what a strawberry it was........Sun drenched, juicy and sweet with just the right amount of tang and texture....The pink wave petunias are also unexpected friends, I haven't planted them fro two years but they are coming up everywhere! This morning I awoke to a fabulous surprise! 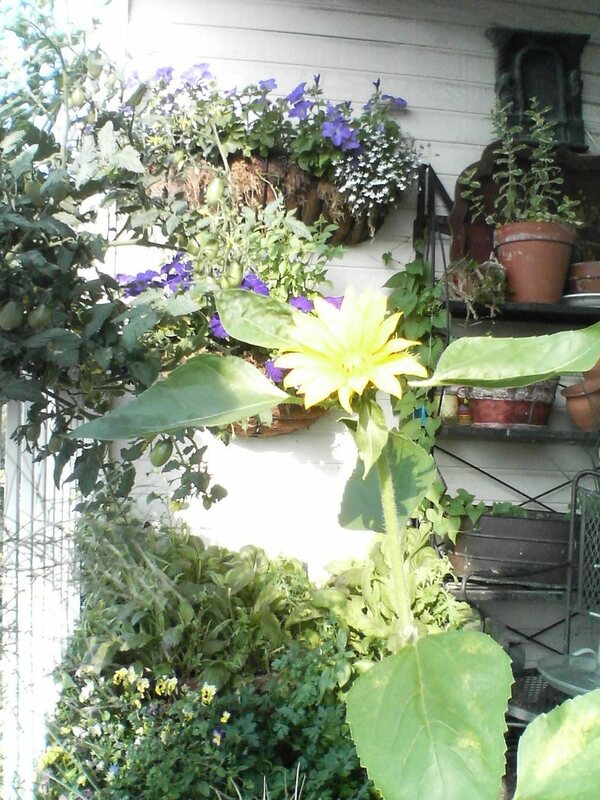 This sunflower had bloomed, and the remarkable thing is that I never planted it! My husband teases me every year, because things just show up in my garden, and I have no idea where they came from. I like to imagine that a sweet bird friend planted it for me, maybe as a thank you present for feeding them all the cold winter! Wherever it came from, it's all the more precious because I'm three floors up!